I need a Photoshop Action that converts an Absolute map into a Relative one. Snigbo kindly provided me a way to convert Absolute into Relative using ImageMagick, which he explained bellow. But I need a Photoshop workflow, as I am not familiar with ImageMagick. "The identity relative map is constant 50% gray, so distorting it doesn't change it; it remains a constant 50% gray. If we want to distort an identity map to get a distortion map, we have to distort the identity absolute map. The distorted result is an absolute distortion map, which we can convert to a relative distortion map using"
Perhaps you should post to a Photoshop forum, since this is not really an Imagemagick issue any longer, if you want all work done in Photoshop. Most people here do not use Photoshop. They use Imagemagick to do their work. So you would be very lucky to find someone who can help you on this forum. I also posted on a Photoshop Forum. But the same applies there, most PS users don't know ImageMagick. I don't use Photoshop, but I expect the task is totally trivial: take the input image, subtract another, and add 50%. The second image must be the same size as the first, with the specified colours in the corners, linearly interpolated between the corners. What you mean by "add 50"? 1- Distorted the absolute image (perspective distort) to create the "absolute distorted map"
Is the resulted relative map correct? Is this a PAID consulting activity? If not, then it needs to be moved to the Users forum. Adding 50% means: to each channel, add 50% of the range of possible values. So 0% (black) will become 50% (middle gray), and 50% gray will become 100% (white), and so on. The result of the subtraction can be negative, for example -10%, so adding 50% makes it +40%. If you take an identity absolute map, and don't distort it at all, and put that through your process, the resulting relative map should be entirely 50% gray. If you do distort it slightly, the resulting relative map should be roughly 50% gray. Thanks Snigbo, will find someone to help me to do this in PS! if is something easy for you, could you provide a PNG with the relative map, for the absolute one bellow? Also, do you have a paypal donation button? I really feel I need to give something back to you! snibgo wrote: If you take an identity absolute map, and don't distort it at all, and put that through your process, the resulting relative map should be entirely 50% gray. I will add one more slight comment. In IM, in a relative distortion map 50% gray means "no change" between input position and output position. 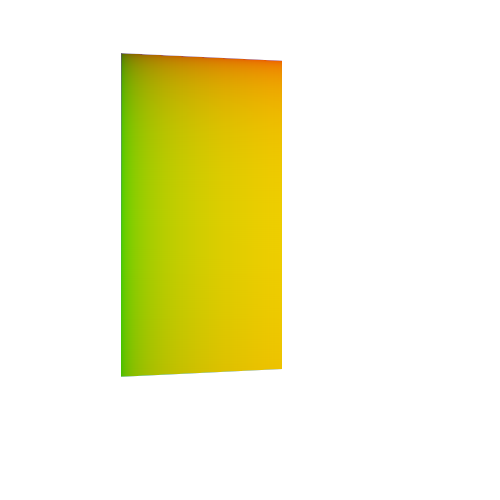 Larger values shift the pixel coordinates one way and smaller values the other way. I do not know how that works in Photoshop or even if 50% is the no change value. alexlsg wrote: if is something easy for you, could you provide a PNG with the relative map, for the absolute one bellow? However, the anti-aliased edges may need separate processing. On the content of relative maps: see my post at https://www.imagemagick.org/discourse-s ... 15#p136701, and the link from there to the SVG spec. Very cool Snigbo, it's working! However there are still lots of transparent pixels, and incorrect perspective/wrap. Maybe it's because the absolute distorted map I sent is in low quality? Is I send a Tif or EXR 32 bits/ channel would help to convert to a "pixel perfect" Relative map? I can't get to either of those links. Your file absolute-distorted-map.png is 500x500, and only 8 bits per channel per pixel. The expected error with 8-bit images is about 1 part in 256. Over 500 pixels, this is an error in position of about 2 pixels, which will be obvious. In experiments with 7500x5000 pixels files, 32 bits/channel/pixel is needed for best results. For web-size images, perhaps 16 bits is enough. But 8 certainly isn't. I have moved this here, since it does not appear to be primarily about Imagemagick nor Paid Consulting. fmw42 wrote: I have moved this here, since it does not appear to be primarily about Imagemagick nor Paid Consulting.